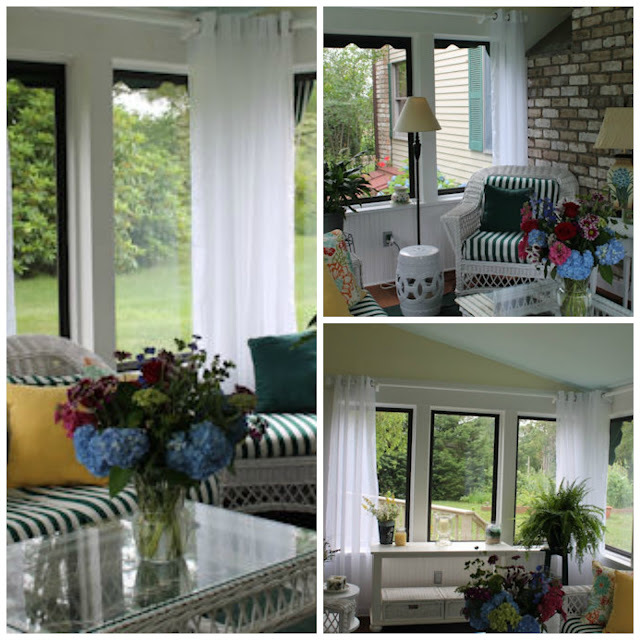 I decided a little over a month ago that it was time to refresh my three season porch. You know what I mean. All of a sudden the porch went from a place where I liked to spend my time to a place I never wanted to be. It was time to fix that. All of the paint in the room needed to be refreshed. 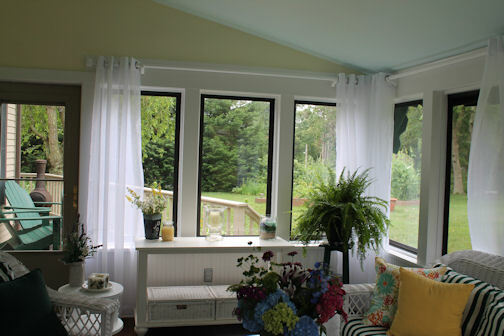 I wanted to brighten the trim around the windows by painting it with Benjamin Moore's Atrium White (PM-13). The previously white walls needed a little color. 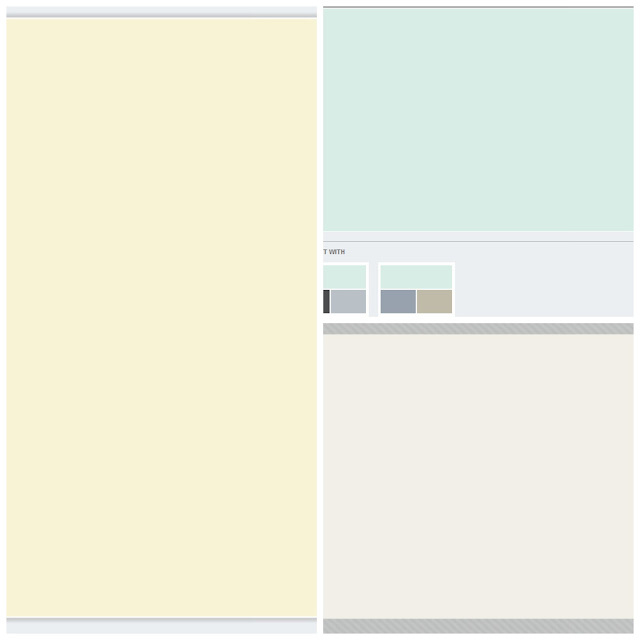 I chose a light butter cream color called Palm Coast Pale (330) by Benjamin Moore. I thought the sloped ceiling might benefit from a little color as well. I chose Benjamin Moore's Spring Mint (2040-70). There was some water damage on the ceiling that had to be fixed. I turned to YouTube for some how-to advice. I was careful and didn't rush the repair. We also decided to add some trim work that helped to cover the worst of it. After three coats of paint around the windows, two coats of paint on the walls and one coat of paint on the ceiling, I was able to think about dressing the windows. I decided to add white painted Martha Stewart rods from Home Depot and grommet top white sheers from amazon.com. The sheer grommet panels were inexpensive but perfect for the room. With the screens in the window, the window panels flutter in the breeze. I love that! You can also see the new white garden stool in the picture above I snagged at Home Goods for $49.99 to pair with the one I got at Home Goods a year ago. 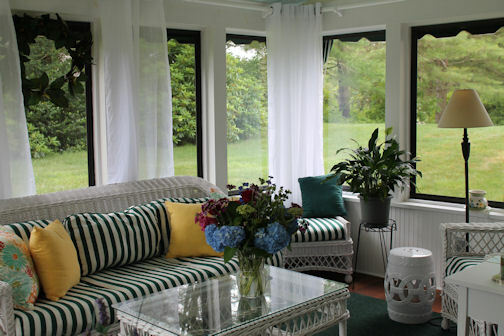 I also bought a couple of colorful pillows to soften the boldness of the dark green canopy stripes on the cushions. A couple of large plants, one a Boston fern, were a must. It's been a week since the work was finished and I've rewarded myself by sitting on the porch each afternoon and reading books. Isn't that a perfect way to spend a summer afternoon? Beautiful transformation! 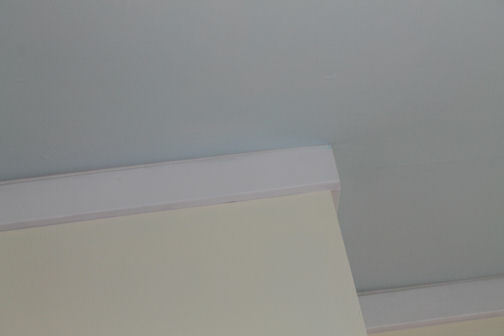 The new room looks so light and airy, and I love that you added a bit of blue on the ceiling. Thanks, Lydia. That little hint of blue on the ceiling adds a lot to the space. The color was suggested by the paint guy at the Benjamin Moore store. I would never have picked it on my own. Who'd think that a color called spring mint would look good on the ceiling?